Feeling somewhat philosophical lately. Perhaps I’ve been a beekeeper so long now (4 months!) that the urge to reflect on my vast experience has come upon me. Either that or I can only provide repeated hive updates for so long on this blog, and thus want to write something profound. Nothing profound to offer, unfortunately, but a couple musing on tools, truths, and the hives. Using the frame grip on a frame from Jupiter. So easy to pick up a frame with one hand and snap a picture with the other. I started using the frame grip shown in the picture, and wonder how I ever got by without it. I’m not brave enough to inspect without gloves, which makes it difficult to pick up a frame as it is normally glued (with propolis) to the side and covered in bees. Now I pry the frame free with a hive tool, grab the middle with the frame grip, and lift it up. No fuss, no bees crawling on my gloves. Simply amazing. Of course, this only applies to the Langstroth frames. On the top bar hive the bars lift out pretty easily, even with gloves on. 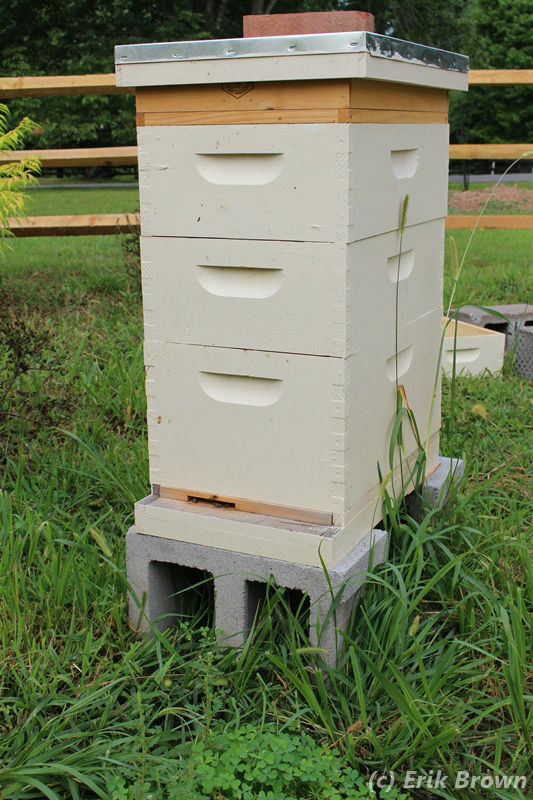 I seem to be much more comfortable manipulating the top bar hive, perhaps because there are fewer moving parts. Mars on Aug 9, 2015, with the feeder on top. I wonder if I should be disappointed with my first year. With three hives I might have hoped for at least one honey crop, especially with two hives starting as nucs in mid-April. The hives are healthy despite some queen troubles, and I have a pretty little bee yard with a pretty little fence and pretty little plants. All this plus a small fish pond the bees steadfastly ignore. Who could ask for more? That said, I have come to realize that my area might be a bit overstocked. There are two semi-professional beekeepers within 2 miles of my home, one to the south and one to the northeast. They each have a healthy collection of hives in their yards. I know of three hobby beekeepers with a few, plus another hobbyist with at least a half-dozen hives. 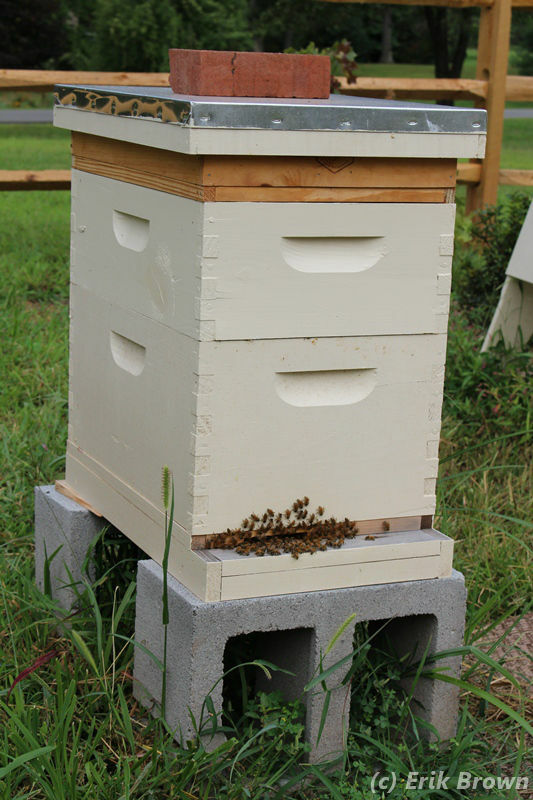 There are probably even more hives within five miles of my house, whose bees would compete for forage with my girls. So there are at probably 30 to 40 and perhaps as many as 40 to 50 hives within 5 miles of our property, making it more difficult for my three hives to forage for a healthy crop. Perhaps it is no surprise the hives did not gather all that I might have hoped. Contemplating this reality, I wonder how best to prepare my bees for next spring. 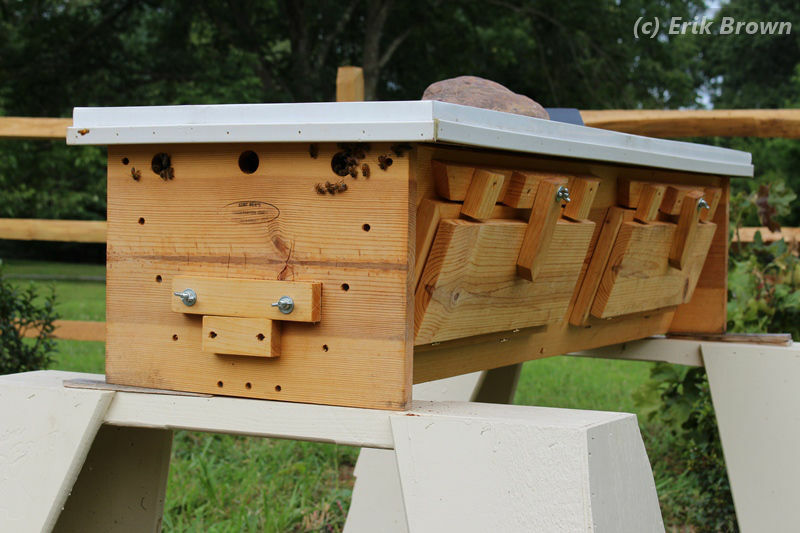 Having a strong hive early could be a benefit, if I could arrange it. More early bees means more nectar gathering capabilities when the main season starts up. Jupiter on Aug 9, 2015. You can see the feeder on top and some slight beading on the front. The hives are building up stores, most likely a result of irregular feeding on my part. I did a full inspection on Aug 9 and found honey and nectar frames in each hive, plus brood and larva to indicate active queens. It has been very hot and dry this past week, so I suspect there is little nectar available for the taking. 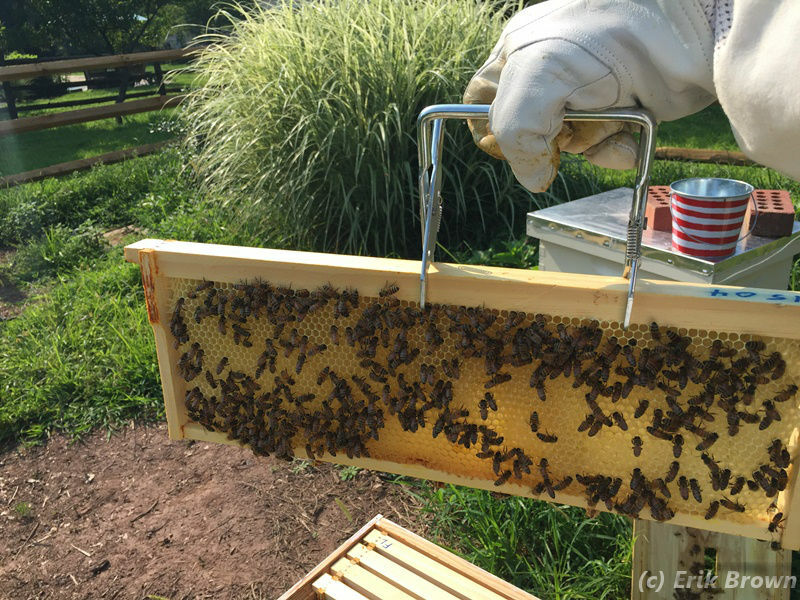 Our two Langstroth hives Mars and Jupiter have received around a gallon or so of 1:1 sugar syrup each week this month, and the top bar hive Venus around 3 or 4 quarts a week. I have been travelling quite a bit lately, so swap it out when I happen to be home. You may recall that I screened a back entrance on Venus over the summer to encourage better ventilation. I’ve noticed a number of bees gathering on the screen these past few weeks, which was a bit of a surprise. Today I figured out that the bees have somehow chewed a hole in the screen, creating a back door into the hive. Not what I intended, so I’ll have to keep an eye on this. As for the Langstroth hives, I’ve noticed Jupiter bearding much more than Mars lately, and wondered if Jupiter could have more bees. Then I remembered that Mars has three boxes while Jupiter has only two. When I opened up Mars to add some syrup I saw just how many bees are packed into the third box. So both these hives seem to have plenty of bees at the moment. With the apparent nectar dearth going on, yet another reason to keep them well fed. 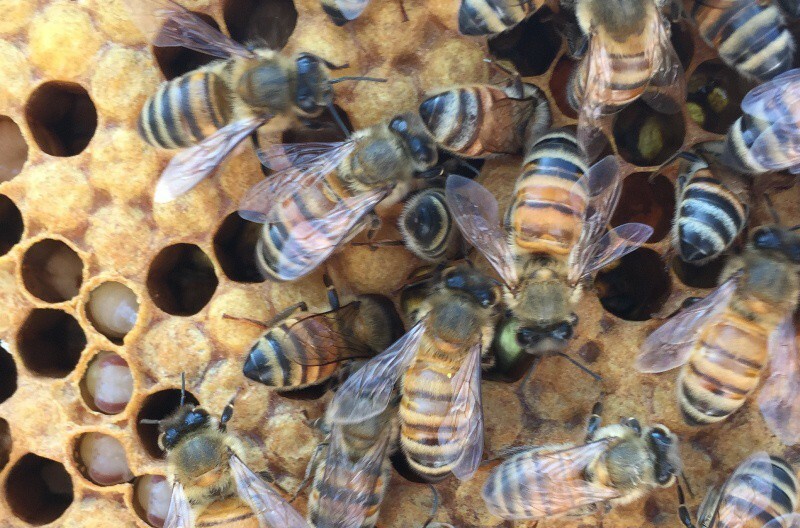 A close up of a frame, with some bees entering the pupa stage at the lower left. Presumably these will soon be capped. The U.S. Declaration of Independence, of course, inspired the words for our title: We hold these truths to be self-evident, that all men are created equal, that they are endowed by their Creator with certain unalienable Rights, that among these are Life, Liberty and the pursuit of Happiness. Are having bees part of pursuing happiness? I would like to think so. This is how I prepare the bees for winter: Apiguard treatment in August; entrance reducer goes on in August; feed 2:1 sugar-water syrup in September to make sure they have enough stores; mouse guard on and insulation placed in roof around November; fondant on in December; oxalic acid drizzle in December; extra fondant on in January/February if needed. If you only do one of these things… Make it the mouse guard!